When winter starts to break and the promise of blue spring skies is just around the corner, you’ll find that there’s nothing more perfect than a glimpse of your first English snowdrop. With pure white flowers hanging gently above the melting snow, its promise that the worst of winter is now over is enough to melt the coldest of hearts. As English as they may seem, their native habitat is restricted to the areas of Asia Minor and mid to southern Europe. However they are so enchanting that even during the bloody battles of the Crimean War (1853-1856), soldiers dug them up to keep in their backpacks so that when they returned home they could plant them in their gardens. For a plant to have such an impact during the horrors of war it’s no wonder that they have become, and still remain, one of the nation’s favourite plants. Although some species are now threatened in their native habitats, snowdrops naturalise readily in our climate and will remain quite happy undisturbed for many years. Along with many of our spring flowering bulbs, snowdrops are available to buy as loose bulbs during early autumn, However, it's best to get them in the ground early as they can quickly dry out and die. Each bulb should be planted 3-4 inches deep into a good fertile soil in either full sun or partial shade. The site should be well drained but not so much that it dries out in the heat of summer. They do best in a moisture retentive, humus rich soil, similar to our woodlands so it’s a good idea to add well decomposed leaf mould to the soil first. This is particularly important when trying to establish dry bulbs. For best results you should buy your plants in the spring otherwise known as ‘in the green’. This means that the bulb has been either protected or grown on in soil, or that the bulbs have been wrapped to preserve their moisture. Either way there should be in full leaf. If they are not, don’t buy them! Once you get your snowdrops there are a number of ways that you can choose to display them. They tend to look their best planted in meandering drifts through borders, or under deciduous shrubs in a woodland setting. Quite often, you will see them planted informally in lawns, or naturalised in grass under a favourite tree. They will even do well planted up in containers, displayed as specimen plants on a patio. There are over 100 species in the wild, and if that doesn't make them difficult to identify they will also hybridise between species. It’s a little easier for the English gardener though, as there are generally no more than half a dozen varieties grown commercially in the UK. The commonest types and varieties of snowdrop are as follows. Common Snowdrop – Galanthus nivalis: This is the most common species available and is seen by many as the ‘traditional’ snowdrop. It grows to a height of around 4-6 inches and flowers from January to March. Given the right weather it can flower long into April. The Double Snowdrop - Galanthus nivalis 'Flore Pleno': This is a double-flowered variety of the common snowdrop. It is very similar but with a much bigger flower by comparison. It requires exactly the same conditions and is also ideal for naturalisation. The Crimean Snowdrop – Galanthus plicatus: This is a much taller variety growing up to 1ft in height. It has distinctive pleated leaves, and flowers from January until March. The Giant Snowdrop – Galanthus elwesii: Originating from Turkey it is not as tall as the Crimean snowdrop despite the name. It reaches to approximately 10 inches in height producing large flowers between January and February. It also has a lovely honey fragrance. 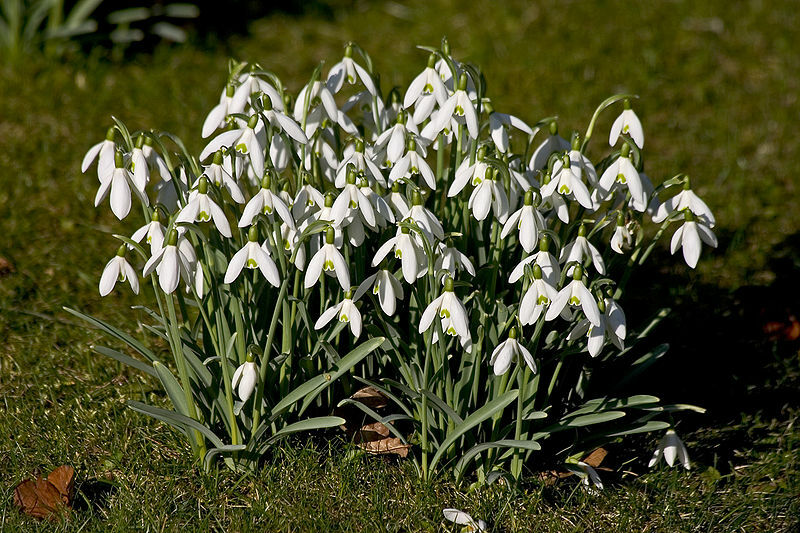 Although it’s tempting to use your snowdrops as cut flowers, be aware of this popular myth. Bringing snowdrops into your home for cut flowers before Valentine's Day can bring you bad luck. If you choose to do so anyway then tradition dictates that you will miss out on any chances of getting married for the rest of the year.